This is a story, aka parable, is based on the story Jesus used that is recorded in Luke chapter 18 of the Pharisee and the tax collector. I wanted to update the characters, without changing the story, but the first obstacle was that some may think I am referring to specific people I know. That could not be further from the truth. Both people are conflations of many hundreds of people I have met in 50 years of living. So if you think I am talking about you, you are wrong. If, however, you are convicted by what the story says, then maybe the Holy Spirit is trying to get your attention regarding some things and attitudes you may be harboring. As before, I still get none of the credit or blame for the results. So here goes. One of these men went home that day justified. Why? Because whenever we start thinking that our standing with God is based on the quality or quantity of our performance, we are basing our salvation on our works, not on the finished work of Christ on the cross. Our standing with God produces good works, and not the other way around. When we deny salvation to those who have not performed a ceremony, or are not doing some list of required works to maintain their saved status, we have fallen from the gospel of grace. But wait, those men in Luke 18 were under the old law and not under the new system. For one, are you saying that under the New Covenant it is more difficult to be saved? Well not to worry. In Luke 16:16 Jesus said that the law and the prophets were only in force until John the Baptist, but after that people could enter into the Kingdom of God. Yes, people were being saved when they believed on Jesus even during His earthly ministry. In the story above, which one went home justified before God? The sinner “too ashamed” to enter in was justified. My question is why does the “sinner” feel “too ashamed”. Was it God convicting him or that he heard that self-righteous one using a “prayer sermon” to judge him? The sinner had become conscious of his utter unworthiness apart from the mercy of God. 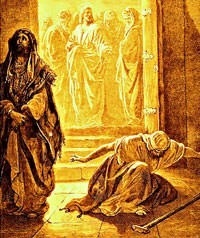 He was truly poor in spirit, whereas the Pharisee was making it clear that he was doing just fine and needed no help. In fact, he felt God should be grateful to have such a good man on his side. In the end, no amount of law keeping, either Old Law or New, is our basis for justification before God. God looks on the heart, and the tax collector was broken and contrite, but the Pharisee was proud of himself, and God hates pride. The tax collector knew there was nothing he could do to earn God’s favor, threw himself on the mercy and grace of God, and walked away justified.